Whatever happened to holographic storage? Can holographic storage be the future of data? Invented in 1956 by IBM, hard drives have changed little over the last 50 years. The most obvious changes have been physical size and the amount of data that can be stored: the IBM 350 RAMAC from 1956, was about the size of two refrigerators and could only store 3.75mb of data. A modern desktop drive can store 3Tb in a unit smaller than a paperback book. While the technology to cram so much data into a tiny space has advanced considerably, the basic principle of a hard drive has remained the same, a rotating disc covered in magnetisable material, spinning past a read/write head. In fact, the way that data is read from and written to a hard disc's platters is very similar to how data is stored on magnetic tape, a technology that harks all the way back to the 1890s. Pick pretty much any science fiction book or film involving computers and you'll probably see a reference to holographic storage, often referred to as data cubes. The idea of being able to store tens or thousands of terabytes of information in a device the size of a sugar cube, has long been a dream of many in computing and storage industries, but with the exception of memory cards, high-capacity, portable storage seems to be somewhat lacking. So what exactly is holographic storage and why is it so desirable? Holographic storage is an optical storage method, in that it uses light to read and write the data. However, unlike existing optical storage technologies, such as CD and DVD, the data is stored in three-dimensions, rather than two. While DVDs may utilise multiple layers, the laser that reads the information can only do so from one angle. In a holographic storage system, information can, in theory, be stored at multiple depths greatly increasing the storage density. Another advantage that holographic storage has over conventional hard disk or optical disc storage is speed. Because the discs in a drive are spinning, data is read in a linear fashion. In holographic systems, the data is read in parallel, resulting in much higher data rates. To store the data, a laser beam is split into two beams, a signal beam and a reference beam. The signal beam passes through a liquid crystal display, which shows a page of binary information, as clear and black boxes. The beam then travels into a light sensitive polymer or crystal substrate, carrying the information from the LCD. A second beam, called the reference beam, is guided onto a separate path into the light-sensitive substrate, and where the two beams meet, an interference pattern is created, which is stored as a hologram. To read the data back, the two beams are shone into the substrate at exactly the same angle as was used to create the data, and the hologram is then read by a Charged Couple Device (CCD), similar to that found in a digital camera. By varying the angle of the beams, data can be stored, potentially, in thousands of different layers, depending on the quality of the substrate used. One of the main developers of Holographic storage was InPhase technologies, which produced the first commercial holographic drive and media. 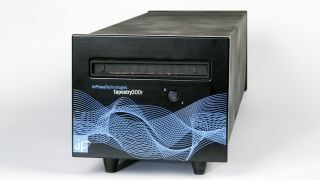 However, far from the data cube idea, InPhase's Tapestry system used an optical disc system, which looks similar to a DVD, held inside a caddy (much like DVD-RAM, in fact). Storage capacity and transfer rates were nothing to get too excited about either. While a 300GB capacity is far more than a conventional optical disc, transfer rates of 20MB/s aren't exactly something to write home about. InPhase filed for bankruptcy in October 2011, although its assets were acquired by startup hVault, although the technology doesn't seem to have progressed much, sill using the same disc-in-a-cartridge system. The technology is currently being pitched at companies that need to archive large amounts of data, with a promised 50-year life-span on the media. Although this compares well to other archive methods, such as tape which need to be periodically re-written to preserve data integrity, there are few data storage systems that have lasted 20 years, so longevity could be an issue. A further issue with current Holographic storage systems is that the write speed is very slow, compared to the read speed, something that all optical systems suffer from. Real-time storage is therefore not really an option, much like you wouldn't use DVD-RW as a replacement for your hard drive. Instead, the tech is more of a Write Once Read Many (WORM) system, like DVD-R, but with much higher data capacity. While hVault's system may be suitable for specialist archiving, the technology has a long way to go before it's going to be an attractive proposition for business, let alone consumers. The drives are huge too, a far cry from the sugar cube concept and not even close to the size of a DVD or hard drive. It remains to be seen if hVault can refine they system into something that can be mass-produced, but for the foreseeable future, we'll have to rely on hard drives and flash memory for our storage needs.